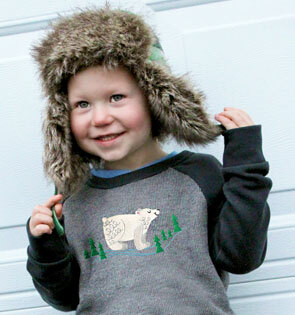 Keep warm and cozy through the cool winter months with new cold weather couture designs! Each of these new designs are perfect for embroidering on sweatshirts, sweaters, scarves, and more, and will add a little color to your winter! 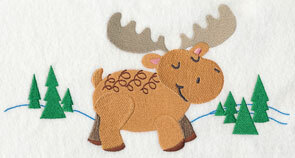 Stitch a cardinal spray on a vibrant cardigan, or add a sweet animal scene to a kids' shirtfront. 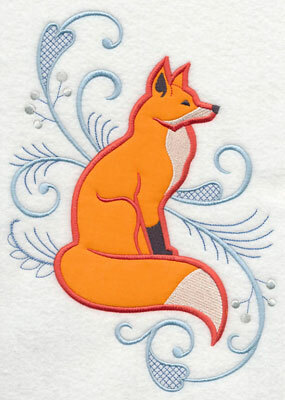 Plus, they're all fabulous additions to pillows, tea towels, wall hangings, and other embroidery projects as well. The opportunities are endless! with this week's new designs! 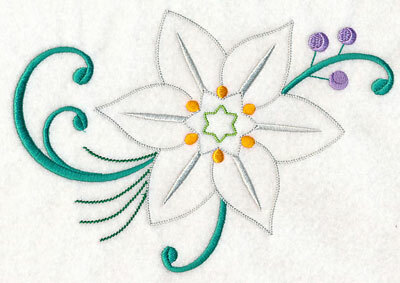 Gorgeous Star of Bethlehem flowers bloom in these elegant flourishes, perfect for adorning sweaters and shirts. The design is available in both stitch-filled and applique versions, too, making it a wonderful addition to a wide variety of projects. 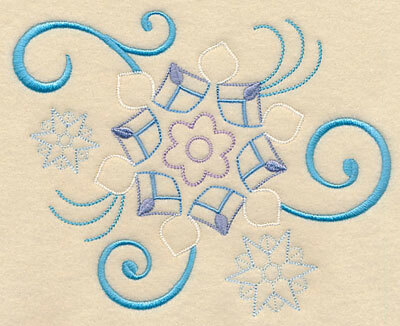 Learn how to stitch applique designs by following this free tutorial. 6.87" x 10.07" and 5.88" x 8.60"
6.89" x 10.10" and 5.88" x 8.61"
5.23" x 7.65" and 4.69" x 6.85"
Use a single Star of Bethlehem accent as a stunning accompaniment to the flourishing sprays above -- it's a brilliant way to highlight a corner, pocket, or sleeve. 8.44" x 5.80" and 6.57" x 4.52" and 3.87" x 2.67"
A bright red cardinal perches amongst pinecones in this classic winter design. The vibrant red of the bird's plume will pop on cardigans, pillows, and wall hangings. 6.68" x 11.01" and 5.70" x 9.40"
4.73" x 7.80" and 4.18" x 6.87"
This light-stitching pinecone is an all-natural highlight to pair with the cardinal sprays above, and is also a great way to spice up tea towels, napkins, and placemats for winter. 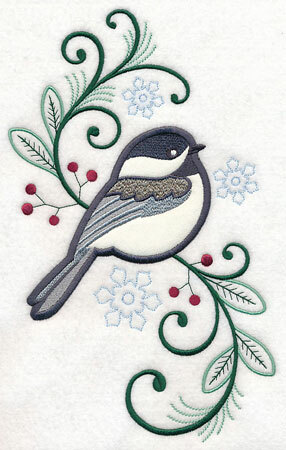 7.58" x 5.88" and 6.30" x 4.88" and 3.89" x 3.02"
Evoke the wonder of a snowy backyard with this exquisite chickadee design. The classic winter birds are flanked by snowflakes and greenery, and are gorgeous additions to any embroidery project. 6.62" x 10.93" and 5.65" x 9.33"
6.63" x 10.94" and 5.67" x 9.35"
4.70" x 7.74" and 4.16" x 6.85"
A sprig of greenery is great for stitching for the winter season (and can be used for Christmas projects, too!). 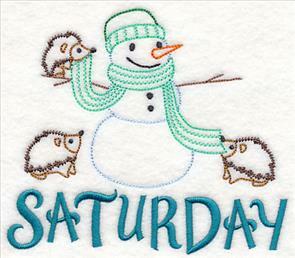 Stitch on the back pocket of a pair of jeans, to a snow hat, or on a winter coat. 6.08" x 5.86" and 5.07" x 4.89" and 3.86" x 3.72"
Add elegant style to sweaters, tote bags, and framed pieces with this foxy design. 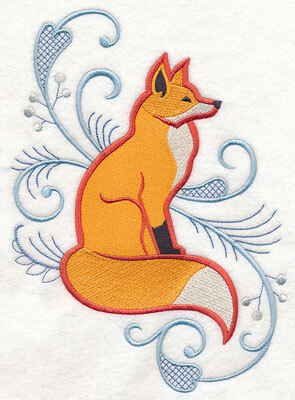 The bright orange color of the sophisticated fox is a brilliant contrast to neutral fabrics and colors. 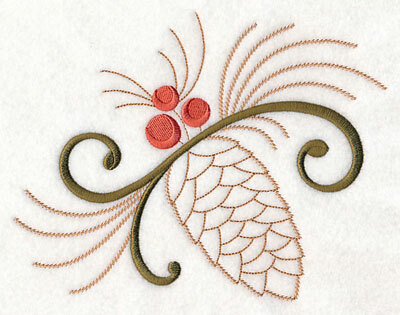 Click here to learn how to stitch the applique version for excellent results. 6.88" x 9.76" and 5.85" x 8.30"
5.33" x 7.57" and 4.84" x 6.87"
Icy blue and silver gives this chic accent a distinctly winter appeal. 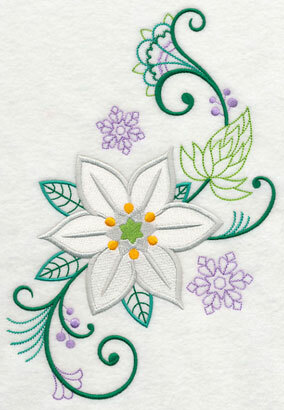 Stitch in various color families to adapt the design for other seasons (orange and yellow for summer; shades of green for spring). 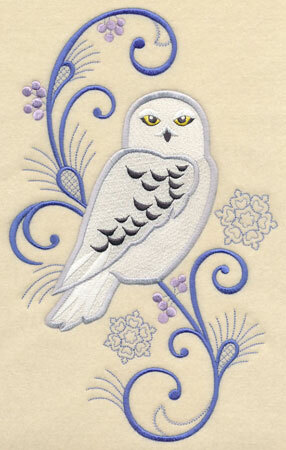 7.81" x 5.87" and 6.40" x 4.82" and 3.87" x 2.92"
A white snowy owl surrounded by snowflakes and filigree swirls is a stunning addition to any embroidery project. Great for cushions, jacket backs, and more! 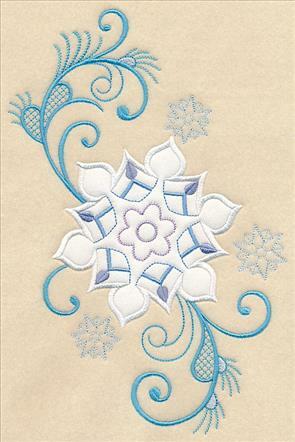 6.90" x 11.01" and 5.87" x 9.36"
4.89" x 7.80" and 4.30" x 6.87"
Use this design to stitch a flurry of snowflakes on a fleece blanket, or add a wintery look to a pillow. 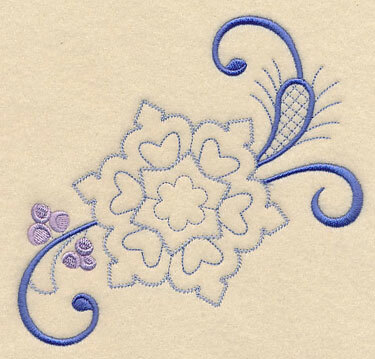 The combination of lighter and heavier stitches give the embroidery design a unique level of depth and texture. 6.19" x 5.87" and 5.13" x 4.87" and 3.87" x 3.67"
Snowflakes in frosty shades of blue and white fall from the sky in this winter spray. 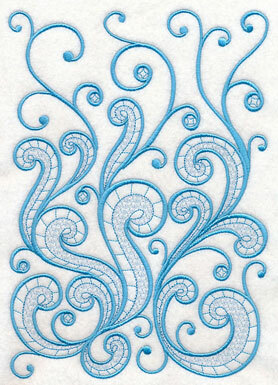 The icy flourish is a beautiful focal point on tote bags, pillow covers, and apparel. 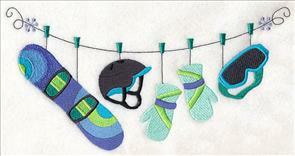 Stitch on a wall hanging to welcome winter into your home. 6.84" x 10.18" and 5.85" x 8.70"
6.85" x 10.19" and 5.85" x 8.71"
5.20" x 7.74" and 4.60" x 6.84"
The detailed style of these snowflakes gives it an almost geometric look, while each of the filigree swirls bring a softness to the design. 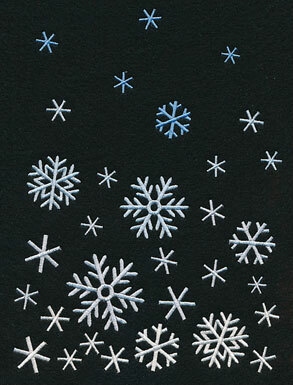 Stitch alongside the snowflakes above for a too-cool design pairing. 7.21" x 5.82" and 5.96" x 4.81" and 3.86" x 3.11"
These bold, colorful borders are inspired by classic Nordic sweater patterns, and will add a timeless look to your shirtfronts and sweatshirts. Gorgeous symmetry and geometric patterns act as a nod to the traditional Norwegian sweaters. 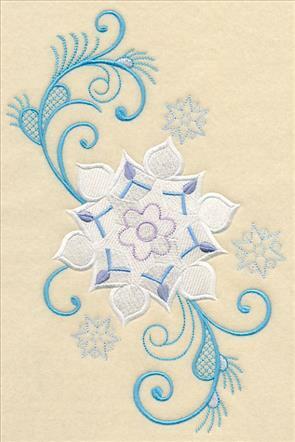 10.99" x 4.94" and 9.38" x 4.19" and 7.78" x 3.48" and 6.85" x 3.06" and 5.24" x 2.34"
A matching snowflake border is wintery complement to the snowy designs above. 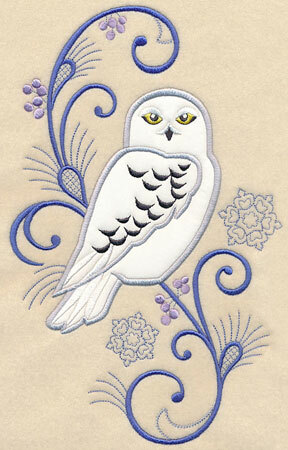 Pair the two on a sweatshirt front, or use as a way to decorate a pillow, quilt, or wall hanging. 10.99" x 2.60" and 9.38" x 2.22" and 7.79" x 1.85" and 6.00" x 1.67" and 3.85" x 1.21"
A beautiful winter flower is surrounded by diamond shapes and foliage accents. Stitch on the front of a sweatshirt for a modern update on the classic Nordic sweater. Get our best tips and tricks for stitching on sweatshirts here. 11.00" x 4.43" and 9.40" x 3.79" and 7.79" x 3.14" and 6.85" x 2.76" and 5.25" x 2.12"
Small flower shapes and sprigs of foliage adorn this matching border. 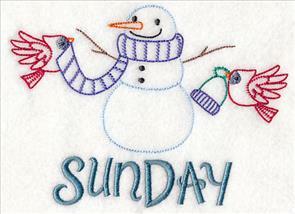 Stitch along with the larger design above, or use singly on a towel, quilt, or blanket. 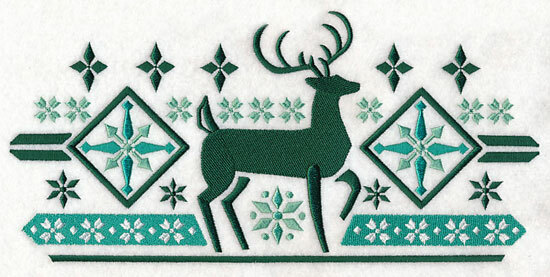 11.75" x 2.97" and 9.40" x 2.38" and 7.79" x 1.97" and 6.00" x 1.60" and 3.85" x 1.27"
Rustic elements are commonly included in Nordic sweaters, and this stately deer design is a wonderful reflection of that cozy, nature-inspired style. 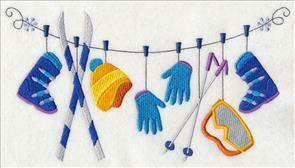 It's a terrific addition to placemats, aprons, and towels as well as apparel. 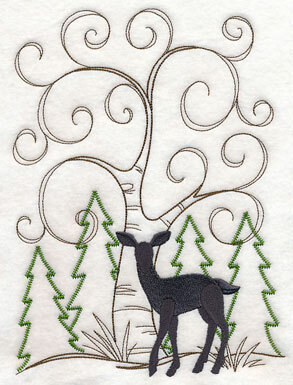 10.99" x 5.26" and 9.39" x 4.50" and 7.78" x 3.73" and 6.85" x 3.28" and 5.25" x 2.52"
Use this deer border in conjunction with the version above, or stitch alone along the edges of blankets and pillowcases. 10.99" x 2.88" and 9.38" x 2.46" and 7.78" x 2.04" and 6.00" x 1.81" and 3.86" x 1.51"
Stitch a majestic Nordic bear as a way to add a little winter spirit into your home! The snowflake, pinecone, and evergreen tree accents add an extra snowy appeal to the design. 11.00" x 5.32" and 9.40" x 4.55" and 7.80" x 3.77" and 6.86" x 3.32" and 5.25" x 2.54"
A matching bear border is a fabulous counterpart to the bear design above. 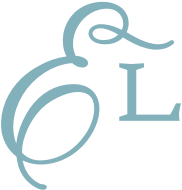 Use to adorn a set of table linens, bed linens, or on a quilt! 11.00" x 2.34" and 9.40" x 2.00" and 7.80" x 1.66" and 6.00" x 1.75" and 3.86" x 1.22"
A dramatic evergreen tree takes center stage in this Nordic border design. Pinecones and other greenery add an even more all-natural style to the winter motif. 11.00" x 4.75" and 9.40" x 4.07" and 7.80" x 3.36" and 6.86" x 2.95" and 5.25" x 2.26"
A row of trees stand at attention in this matching tree border design. Alternate between stitching the two rows on your projects, or use one as the focal point and the other as an accompanying design. 11.00" x 2.74" and 9.40" x 2.33" and 7.80" x 1.93" and 6.00" x 1.63" and 3.86" x 1.82"
Scarf edges are a creative (and totally cute) way to embroider your winter wear. 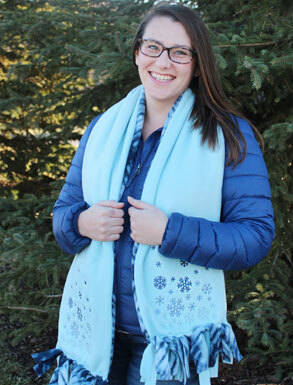 Here a storm of snowflakes in varying shades of frosty blue amp up this fun scarf. Click here to get project instructions for this fuzzy fleece scarf. Add a flurry of snowflakes to the bottom of your scarf for the perfect winter look. 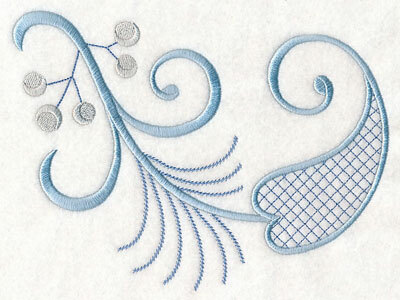 6.87" x 9.44" and 5.68" x 7.80" and 4.85" x 6.67"
Gorgeous filigree swirls and twirls in this intricate design; a winter forest full of whimsy is a rustic embroidery design. These designs have also been digitized to fit at the end of a scarf, but they're also fabulous additions to pillows, quilts, and wall hangings, too! 6.90" x 9.72" and 5.87" x 8.26"
6.90" x 9.29" and 5.79" x 7.80" and 4.85" x 6.52"
Figure skates, earmuffs, and other winter gear hang from this winter sports clothesline, and is ready to be stitched on t-shirts, sweatshirts, and other apparel items. If you're new to stitching on sweatshirts, you can find helpful tips and tricks in this Fabrics 101 article right here. 9.40" x 4.47" and 7.80" x 3.71" and 6.85" x 3.26"
If you're more likely to hit the slopes than the rink, stitch these snowboarding and downhill skiing clotheslines instead. Try on tote bags or sports equipment duffels, plus sweatshirts and t-shirts, too. 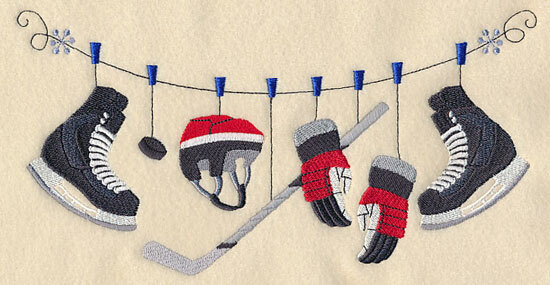 9.40" x 5.15" and 7.80" x 4.28" and 6.87" x 3.77"
A clothesline full of hockey equipment rounds out the group of winter sports designs, and is a great way to stitch for the hockey player in your life. Get helpful tips and tricks for stitching on sweatshirts right here. 9.40" x 4.81" and 7.80" x 3.99" and 6.87" x 3.52"
Adorable Arctic animals are too-cute additions to kids' shirts, sweatshirts, and other fun projects for your little ones. Here a wolf howls at the moon; a pair of penguins play on the ice. 11.00" x 5.44" and 9.40" x 4.65"
10.99" x 5.31" and 9.37" x 4.53"
7.78" x 3.76" and 6.85" x 3.31"
These sweet animals feature fun swirls and other details in their fur, and the moose and bear featured below are pleased as punch about it! 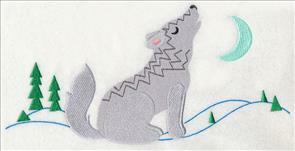 These smiling Arctic friends are also fun on towels, blankets, and totes, too. 11.00" x 5.80" and 9.41" x 4.96"
7.81" x 4.12" and 6.85" x 3.61"
11.00" x 4.96" and 9.39" x 4.23"
7.79" x 3.51" and 6.85" x 3.09"
The little boy or girl in your life will love wearing a sweater adorned with one of these Arctic animals! They're the perfect addition to sweatshirts and t-shirts -- learn more about stitching on sweatshirts here. A swimming narwhal navigates the icy water; a seal relaxes on a block of ice. 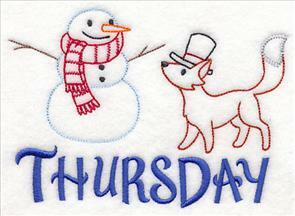 Stitch these cold weather pals on your next embroidery project! 10.96" x 4.51" and 9.38" x 3.86"
7.80" x 3.21" and 6.86" x 2.83"
10.97" x 5.16" and 9.38" x 4.41"
7.80" x 3.68" and 6.85" x 3.23"
Add an arctic animal to kids' shirts and sweatshirts, or stitch them all on a too-cute quilt! 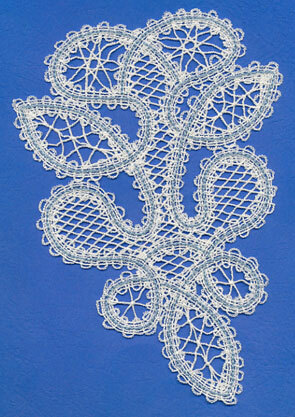 The delicate style of Battenburg lace adds a boutique-inspired look to your embroidery projects. 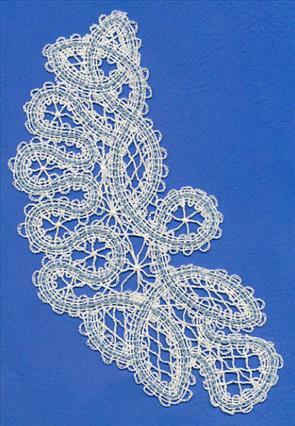 Its unique use of cotton thread to replicate a hand-crocheted look sets it apart from other freestanding lace designs. 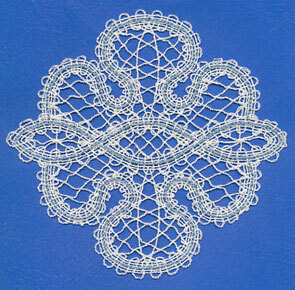 Click here to learn how to stitch Battenburg lace. 6.76" x 7.79" and 5.84" x 6.73"
7.50" x 6.84" and 6.41" x 5.84"
5.34" x 4.87" and 3.87" x 3.53"
Sweaters, sweatshirts, and other apparel can get a lovely, elegant update when adorned with Battenburg lace. Get project instructions for adding Battenburg lace to a sweater right here. 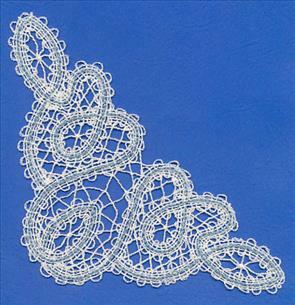 Everyday apparel is the perfect way to use these Battenburg lace designs. Try it as a border around the bottom of a scarf, or the highlight the cuffs of your sleeves. 9.37" x 3.31" and 7.74" x 2.74" and 6.00" x 2.12" and 3.87" x 1.38"
The freeform style of this Battenburg lace makes it the perfect addition to apparel. Click here for project instructions for adding Battenburg lace to a sweater. 3.10" x 9.37" and 2.57" x 7.79"
6.63" x 9.35" and 5.53" x 7.79"
4.86" x 6.85" and 2.75" x 3.87"
A coordinating Battenburg corner finishes this group of lacy designs. They're fabulous additions to table linens, pillows, and tablecloths, too. 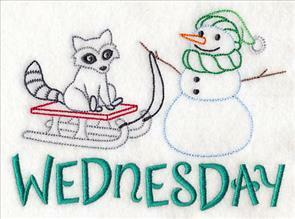 6.89" x 6.79" and 5.89" x 5.81"
4.88" x 4.82" and 3.88" x 3.83"
Days of the week designs are fabulous additions to tea towels! 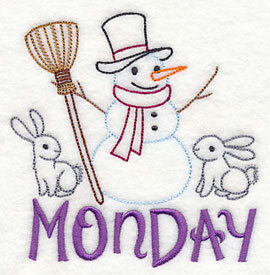 Many of you requested we create a version using snowmen -- we loved the idea! 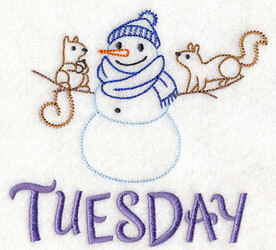 Add these frosty snowmen designs to your next set of towels! 4.76" x 4.84" and 3.80" x 3.86"
These vintage-style snowmen are engaging in their favorite winter activities, such as sledding, putting on their hats and scarves, or hanging out with their woodland animal friends. 6.47" x 4.78" and 3.86" x 2.85"
The name of the day on each of these designs is the last color stop, so you can also stitch the snowmen on their own! 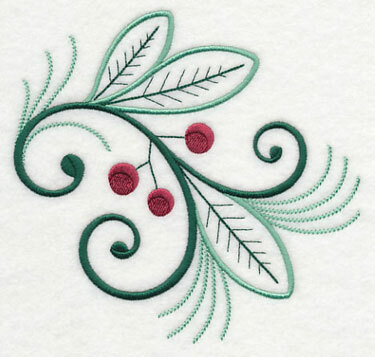 Use them on a quilt, or to decorate a winter wall hanging. 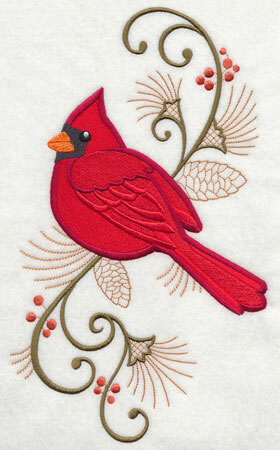 4.21" x 4.77" and 3.41" x 3.86"
Vintage-style designs are best on smooth, neutral fabrics, such as tea or flour sack towels. Find good quality blanks at Target, Home Goods, Kohl's, and TJ Maxx. 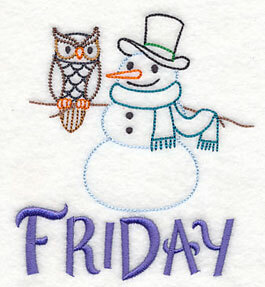 5.58" x 4.84" and 3.86" x 3.35"
Let these sweets snowmen adorn your next set of tea towels!